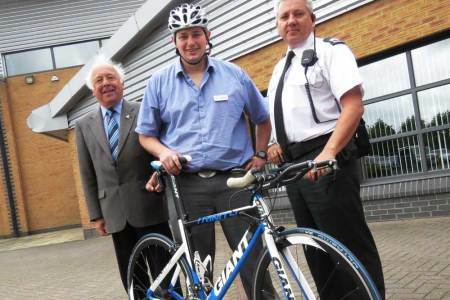 The new BikeRegister scheme will involve a number of police-backed bike marking events held across the District where bike owners will be offered the kits and advised to register details of their bike onto the BikeRegister website. “North Belfast DPCSP is pleased to have been able to support this initiative which is aimed at reducing crime affecting bike owners in North Belfast. “We are at the beginning of a process of building partnerships to improve community safety in the district and are committed to working with PSNI and a range of partners to achieve this. Details of bikes that are lost or stolen will be held on the secure BikeRegister database which is owned and managed by security company Selectamark and which can be accessed by Police 24-hours a day. When a lost or stolen bike is recovered, the owner can easily be identified using the scheme. If a bike is not registered there is no way of knowing who it belongs to. The scheme is funded by the Assets Recovery Incentivisation Scheme and North and West Belfast Policing and Community Safety Partnerships (DPCSP). “I welcome any initiative that reduces crime within our area. In particular, this crime often impacts on young children who find their prized possession stolen. “The bike scheme will serve both as an effective deterrent to would be bike thieves as well as an excellent mechanism for ensuring that stolen bikes that are subsequently recovered will find their way back to their rightful owner.